The Way is a 2010 Spanish drama film directed, produced and written by Emilio Estevez and starring Martin Sheen, Deborah Kara Unger, James Nesbitt, Yorick van Wageningen, and Renée Estevez. Dr. Thomas Avery (Martin Sheen) is an American ophthalmologist who goes to France following the death of his adult son, Daniel (Emilio Estevez), killed in the Pyrenees during a storm while walking the Camino de Santiago (the Way of St. James), a Catholic pilgrimage route to the Cathedral of Santiago de Compostela in Galicia, Spain. Tom's purpose is initially to retrieve his son's body. However, in a combination of grief and homage to his son, Tom decides to walk the ancient spiritual trail where his son died, taking Daniel's ashes with him. While walking the Camino, Tom meets others from around the world, all looking for greater meaning in their lives. He reluctantly falls in with three other pilgrims in particular. Joost (Yorick van Wageningen) is an overweight man from Amsterdam who says he is walking the route to lose weight to get ready for his brother's wedding and also so that his wife will desire him again. He is a friendly extrovert who is the first to start walking with Tom. Sarah (Deborah Kara Unger) is a Canadian fleeing an abusive husband, who says she is walking the pilgrimage to quit smoking. Jack (James Nesbitt) is an Irish travel writer who when younger had desires to be a great author like William Butler Yeats or James Joyce but never wrote the novel he dreamed of. He is the last to join the quartet and has been suffering from "writer's block". As the pilgrims travel the Camino, they occasionally meet and talk with other pilgrims—two Frenchmen, a young Italian and Father Frank, an elderly priest from New York. Tom occasionally sees visions of Daniel alive and smiling among other people. On the pilgrimage, the group experiences challenges, such as when a young Romani steals Tom's backpack. Although the thief escapes, his father drags him back to Tom to return the pack, with embarrassed apologies and an offer to attend a street party in compensation. The film was inspired by Emilio Estevez's own son, Taylor. It started in 2003 as a project when Taylor, at the time 19 years old, and Sheen, whose TV series The West Wing was on hiatus, traveled the pilgrimage route. Taylor, who served as an associate producer on the film, had driven the length of the Camino with his grandfather. On the way, he met the woman who would become his wife; thus, the Camino held special meaning for him. After the trip, a series of discussions started between Sheen and his son for a movie about the Camino de Santiago. Sheen originally suggested it be a low-budget documentary, but Estevez was not interested in such a small project, wanting instead a bigger experience. Estevez also found inspiration in his vineyard, Casa Dumetz, where he wrote much of the dialogue for the film. Exploring the universal themes of loss, community, and faith, he saw parallels with the characters of the film The Wizard of Oz (1939). The script took six months to get a first draft. According to the opening credits, the story is also based on selected stories from Jack Hitt's book Off the Road: A Modern-Day Walk Down the Pilgrim's Route into Spain (1994). Filming started on 21 September 2009 and took 40 days. The production company and actors walked between 300 and 350 kilometers during filming. Estevez had a very small crew and shot with available light; night-time sequences were filmed by candle and firelight. Considering the Camino is special to local people on the route, the filmmakers felt great pressure to get the details right. According to a Christian Broadcasting Network interview, a key scene almost did not happen. With church leadership opposed to allowing the crew to shoot inside the famous cathedral in Santiago de Compostela, Estevez says he took a leap of faith and asked everyone on set to pray for access. "And it worked", claimed Sheen. The crew was given permission just 48 hours before they were scheduled to shoot the scenes, which they felt were critical to the film. Sheen originally suggested Michael Douglas or Mel Gibson for the lead role, but Estevez had written the main character's role specifically for his father. Aside from the main actors, those seen on-screen are real pilgrims from all over the world. One episode in the film involves a group of actual Romani people from Burgos. The Way was marketed largely via a word-of-mouth campaign. "We don’t have a lot of money to do a big $40 million P. & A. ", Estevez said, talking about his marketing print-and-advertising budget. The Way premiered in September 2010 at the 2010 Toronto International Film Festival and was commercially released in Spain first, with its Spanish premiere on November 10, 2010. The Maltese premiere on February 28, 2011 benefited a tiny Maltese organization, the Pope John XXIII Peace Lab of Ħal Far, which provides shelter to asylum seekers. The shelter, established in 1971, had not sought the funding. The film was released in the United Kingdom in May 2011 and in the United States in October 2011. Estevez and Sheen took a promotional bus tour in promotion of the film across the United States and through some parts of Canada. The film was released on DVD in February 2012. The film took in $110,418 in its U.S. opening weekend; as of February 2012, it had made $4,430,765 domestically with its widest release in 283 U.S. theaters. The film has received a "Certified Fresh" rating of 83% on the review aggregator website Rotten Tomatoes based on a sample of 98 reviews, with an average score of 6.61/10. The consensus description is: "It may be a little too deliberately paced for more impatient viewers, but The Way is a worthy effort from writer/director Emilio Estevez, balancing heartfelt emotion with clear-eyed drama that resists cheap sentiment." Peter Travers of Rolling Stone magazine gave the film three out of four stars, while Andrew Schenker of Slant Magazine gave it 1 out of 4 stars. Eric Kohn of Indiewire gave the film a "B+" rating, commenting that "Estevez's narrative is dominated by master shots of the landscape capturing Tom and his pals wandering through the wilderness and small villages, exploring ancient cathedrals and local traditions." Kirk Honeycutt of The Hollywood Reporter wrote a mixed review, stating: "Emilio Estevez's The Way is an earnest film, its heart always in the right place, but it's severely under dramatized." Sheri Linden of Los Angeles Times noted that The Way is more low-key, cohesive, and personal than Estevez's preceding film Bobby. ^ a b "The Way". boxofficemojo.com. 15 March 2012. Retrieved 17 April 2017. 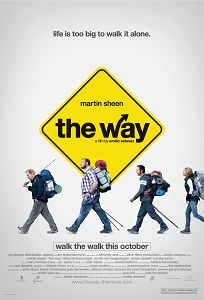 ^ "The Way [DVD] (2010)". amazon.co.uk. 31 October 2011. Retrieved 30 April 2017. ^ "The Way - La route ensemble". amazon.fr. 19 February 2014. Retrieved 30 April 2017. ^ "The Way". the-numbers.com. 5 October 2012. Retrieved 4 April 2019. ^ a b c d Siedlecka, Jo (24 February 2011). "A father and son project: Martin Sheen, Emilio Estevez discuss The Way". Independent Catholic News. Retrieved 17 March 2011. ^ a b Marilyn Beck and Stacy Jenel Smith (7 March 2011). "Charlie Has Goddesses, But Emilio and Martin Have Angels". Dallas-Fort Worth Tribune. gouverneurtimes.com. Archived from the original on 2012-03-13. Retrieved 17 March 2011. ^ a b Kennedy, Dana (1 March 2011). "Martin Sheen in Malta 'Taking a Break From Everything'". AOL News News. Archived from the original on 3 March 2011. Retrieved 5 March 2011. ^ a b c Zagursky, Erin (24 February 2011). "Pilgrimage brings together Hollywood stars, academics". The College of William & Mary. Retrieved 19 March 2011. ^ Dwyer, Fr Dave (7 April 2010). "Emilio Estevez and The Way". bustedhalo.com. Retrieved 19 March 2011. ^ a b c d e f McLean, Craig (21 March 2011). "The Way: interview with Martin Sheen and Emilio Estevez". The Telegraph. Retrieved 22 March 2011. ^ a b Wallace, Amy (22 January 2011). "Growing Grapes as Part of a Real-Life Script". The New York Times. Retrieved 28 February 2011. ^ "Emilio Estevez and Martin Sheen on Faith and Filming 'The Way". CBN.com. ^ fbavinton (1 March 2011). "The Way: Interview with Martin Sheen & Emilio Estevez". YouTube. Retrieved 5 March 2011. ^ "The Way Archived 2010-08-15 at the Wayback Machine". Toronto International Film Festival. Retrieved on August 29, 2010. ^ "Martin Sheen and Emilio Estevez in Malta for "The Way" movie premiere". Embassy of the United States to Malta. 17 February 2011. Archived from the original on 23 June 2011. ^ Thompson, Anne (28 July 2011). "Estevez's The Way Hits AMC Theatres October 7". Indiewire. Archived from the original on 12 August 2011. Retrieved 28 July 2011. ^ "The Way". Rotten Tomatoes. ^ Travers, Peter (October 6, 2011). "The Way - Movie Reviews". Rolling Stone. ^ Schenker, Andrew (October 2, 2011). "The Way". Slant Magazine. ^ Kohn, Eric (October 7, 2011). "Emilio Estevez's 'The Way' Is a Lot Better Than It Looks". Indiewire. ^ Honeycutt, Kirk (October 14, 2010). "The Way: Film Review". The Hollywood Reporter. ^ Linden, Sheri (October 7, 2011). "Movie review: 'The Way'". Los Angeles Times.